In 2010 Newcastle piloted the use of a budget to support carers in the area using PB. In what is believed to be an England first, the carers themselves decided how money should best be spent to meet their needs, rather than council officers making the decisions for them. Carers from across the city met to decide how to spend £50,000 to support them in their roles as carers. The money came from the the councils Adult and Culture services department, and traditionally, officers have always decided how the money should be spent. This time, however, the service users were in charge. The projects proposed came from a mixture of public sector services and local community and voluntary groups and projects – all with the theme of supporting people in their carers role. 218 people from a hard to reach group took part in a decision-making process – they were living city wide, of different ages, cultures and experiences. The majority had no connection to any group or organisation. Creating a framework of services and projects in response to the needs expressed by the service user. 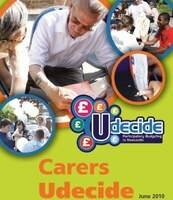 Forming an enthusiastic and committed Steering Group that is representative of a wide variety of carers across the city. Raising the profile of carers’ issues with organisations and groups who had not considered delivering services for carers in the past. Creating new opportunities for carers in their communities. Encouraging organisations to reconfigure their work to take (often new) client group’s needs into consideration. Evaluation – evaluating the process has been done previously but we have agreed to evaluate the benefit to carers and evaluation of the organisations.